Lonely Robot’s John Mitchell, Marillion’s Pete Trewavas and It Bites’ John Beck: a sleeping supergroup emerges from a 13-year hibernation. Where’s the dial headed? Prog musicians are a restless bunch. There aren’t many other genres, apart from maybe hip-hop, in which the leading lights collaborate, guest, spin-off, supergroup and side-project the way prog’s finest like to do. That’s particularly true of prog’s second generation, which came of age in the neo-prog scene of the 1980s. Marillion’s Pete Trewavas was one such graduate of the class of 1985, and with Edison’s Children and Transatlantic also among his going concerns, a second album from Kino lengthens his CV yet further. Mind you, John Mitchell, prolific producer, guitarist with Arena and Frost*, mastermind of Lonely Robot, solo artist and now frontman of It Bites, makes Trewavas look a slacker in comparison. Of course, supergroups have played an indispensable role in the development of progressive rock since its 1960s inception, but is that always for the best when their output is stretched so thinly? Given our natural tendency as fans to cling to our favourite artists and bands like loyal customers of a brand, it’s sometimes hard to emotionally invest in on-off, irregular side projects whose body of work is inevitably somewhat disjointed. Nearly a decade and a half after the first Kino album, what kind of music do we expect to hear when that name is turning around the record deck spindle? Well, they didn’t shy away from big, broad tunes on their 2005 debut Picture, and nor have they on Radio Voltaire. “It is a collection of pop songs. But ones we have messed around with.” That was Mitchell’s verdict on announcing this release, but of course, the Devil is in the details, and it’s often the messy bits that provide the richest flavours. We can definitely slap that label on the barely comprehensible wartime-style radio announcement that introduces the album, but then the title track rides in on Rothery-esque guitar melodics before an undulating midnight piano pattern builds an emotive verse, then transforms into a sweeping harmony-soaked chorus reminiscent of Christian rock, to the point where it almost has the feel of a crescendo-buoyed, redemptive final track. Nonetheless, its seven soaring minutes constitute a powerful handshake to welcome us in. If that gives the impression that this will be a more easy-going affair than Picture, The Dead Club suggests otherwise. Introduced by the sound of needle on vinyl and a crackly German radio announcer, it then employs shock and awe tactics, via explosive prog-metal riffage, techno grunt and weird kitsch keyboard diversions. References to ‘jihad’ in the same passage as a ‘demonic narcissist’ who will self-implode are spat into a swirling mix of keyboards and more offbeat metal thunderstorms. Mitchell then bemoans ‘moronic agelessness’ and adds ‘When it takes its toll it’s only rock’n’roll’. If he’s comparing self-destructive artists to jihadi suicide bombers, it’s an original and striking analogy. For the most part, though, Radio Voltaire is highly accessible, with regular twists along the way. I Don’t Know Why has an 80s pop-rock feel as Mitchell tells an errant lover stringing him along ‘every single way, like some Doris Day’. Then hair-tearing guitar breaks and agitated drum fills giving a tale of romantic frustration a sense of antsy impatience. Out Of Time initially sounds it could have been a hit in It Bites’ chart-busting early days, before, after a couple of minutes, the layers begin to fall away and we’re left first with a syncopated guitar riff and halting drumbeat, then hesitant rimshots, timpani, strings and, oh yes, brass accompaniment, as if soundtracking a movie character’s waxing and waning mood swings. And then eventually we’re back into the big, booming chorus. The urgent rush of I Won’t Break So Easily Anymore, full of gutsy defiance, ties more knots in the linear pop template as John Beck’s keyboard improvisations crawl hyperactively all over it as it accelerates to a final crashing burnout. 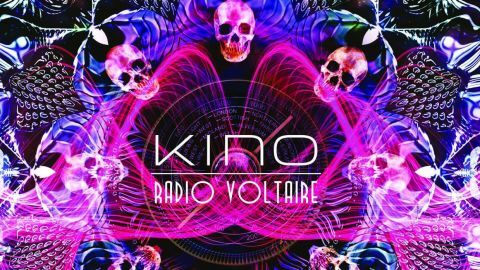 So if that’s the identifying approach of Kino – radio-friendly rock sprinkled with prog spice, then it’s an effective one, even if at times their admission that there’s no overall concept or thematic link to these songs is sometimes telling. While the aforementioned title track sounds like a premature climax, the album ends with the mournful war story of The Silent Fighter Pilot, with lyrical references to Passchendaele and WH Auden’s Stop All The Clocks, building into a thunderous, anthemic swell before squalls of guitar from Mitchell blaze, crackle and then spiral into nothing like the shot-down plane suggested in the title. Yet what should be an emotional climax feels like it’s reaching for top gear and not quite finding it. But if this feels more like a compilation of songs than a solidly coherent album, it contains considerably more hits than misses. And with that, Mitchell, Trewavas et al are doubtless off to the next project. Can we expect a third Kino album in around 2031? No pressure, guys.